The latest addition to Canon’s expanding range of Wi-Fi-enabled cameras, the Canon IXUS 255 HS sits in the middle of the IXUS range, competing against compact cameras such as the Panasonic SZ9 and the Nikon Coolpix S6500. Available in silver, black or hot pink, the Canon IXUS 255 HS – known as the Canon PowerShot ELPH 330 HS in the US – has a wide range of attractive features, including inbuilt Wi-Fi, Full HD movie capture and intelligent Image Stabilisation (IS). With its 10x optical zoom, 24mm-240mm (equivalent) ultra wide-angle lens and 12.1MP CMOS Digic 5 sensor, the Canon IXUS 255 HS is designed with low light photography in mind. Image stabilisation and Canon’s High Sensitivity (HS) system should work together to enable great shots even when shooting in less than optimum conditions. Canon has opted not to include a touchscreen with this model. When it comes to shooting, you can choose between full Auto mode or Program mode, and while there isn’t a dedicated scene mode as such, there are a variety of options available within the Automatic menu including Portrait, Smart Shutter, Toy Camera and Fireworks. There are several white balance options (including a custom setting), while the sensitivity ranges from ISO 80 to an impressive ISO 6400. You can also choose to use My Colours, which are different image styles, similar to the Picture Styles found on Canon EOS cameras, which are roughly similar to old film types, such as Vivid, Monochrome or Positive Film. The Canon IXUS 255 HS also offers Stitch Assist, a function designed to help you create panoramic images post-capture. Portrait mode offers the option to tag up to 12 of your friends’ faces, who are automatically the focusing priority if they’re in a shot. Video options include Full HD movie (1920 x 1080) down to Standard Definition (640 x 480) quality. Alternatively, you can select Super Slow Motion Movie, which shoots clips at high speed for slow-motion playback. The Canon IXUS 255 HS is equipped with a Hybrid Auto function, which when enabled automatically captures short video clips (usually three to four seconds) before every shot. Those clips are then put together to create a “Movie Digest”, which can be viewed and edited on the camera. The camera also determines the best settings to use for the still images from the information it gathers from shooting the movie clips. The Canon IXUS 255 HS is priced at £229 / US$229 / AU$279.95, and is aimed at users who like to have a little more control over their setup, while still travelling light. You won’t find a huge number of manual controls, but you at least have a few options such as white balance and exposure compensation available to control if you want to. With its distinctive metal housing and soft touch buttons, the design and build quality of the Canon IXUS 255 HS is solid and durable. It’s more than slim enough to fit comfortably in a pocket, which is a plus for those looking for an everyday camera, while still being heavy enough not to feel flimsy or breakable. While there is no grip on the front side, it’s comfortable and easy to hold one-handed, although the 3-inch LCD screen makes it rather difficult to adjust any settings when shooting this way. Because all the buttons are grouped to the right of the screen, it leaves little space for manoeuvring your thumb, especially if you have larger hands. When using the camera two-handed, however, it’s easy enough to press all the different buttons, with the record button staying nicely out of the way of an accidental thumb press. The majority of the buttons are well thought out and clearly labelled, with the shutter release button and zoom switch controls situated on the top and everything else neatly arranged on the back. The use of a toggle switch isn’t new for the IXUS range, but whereas previously it was used to switch between Auto mode and Program mode (as on the Canon IXUS 115 HS, for example) on the Canon IXUS 255 HS it switches between Hybrid Auto and normal shooting. The only real gripe we have with the build quality of the Canon IXUS 255 HS is the battery and memory card flap, which can be a little tricky to slide open at times, especially without some unwanted button pressing as you do so. Taking cues from the rest of the cameras in the IXUS range, the menu system is succinct and easy to navigate. All the shooting modes are selected via the function menu on the four-way control pad, with sub menus for different settings such as sensitivity selection and white balance, while extra options such as time and date can be accessed by pressing the dedicated menu button. If you want to use the inbuilt Wi-Fi to connect to your smartphone then it is relatively simple to set up once you’ve downloaded the free compatible app. It’s only possible to use the Wi-Fi to share photos from the Canon IXUS 255 HS to your smartphone or a computer, however – there’s no option to use your smartphone or PC as a remote trigger to take photos, which is a bit of a shame. When you’re in playback mode the Wi-Fi settings can be activated via the four-way control pad, which is a nice touch. You can also transfer photos to your PC via the Wi-Fi, but it’s probably quicker to do it with a cable if you have one available. The LCD screen copes well in the majority of situations, giving a good representation of colours. The only area it struggled with during this test was during very bright sunlight, where colours were a little hard to determine accurately, due to a little glare on the screen. The IXUS camera range has always traditionally performed well, and the Canon IXUS 255 HS is certainly no exception. The shot to shot time is quick, and a full battery charge enables you to shoot for a few days of moderate use, including some video shooting, before needing to be recharged. The Canon IXUS 255 HS doesn’t come with the option to charge the battery in-camera, but charging via the cradle only takes a couple of hours. We were impressed by the image quality from the Canon IXUS 255 HS, where colours are vibrant and accurate and the majority of the time the shots are well exposed, as you can see in our sample images on the next page. The default focusing mode, Face AiAF, puts in a slick performance. Whether you’re using full Auto mode, Program mode or one of the scene modes it’s quick and accurate, locking onto the subject with ease in the majority of cases. In instances where the lens is aimed at large sections of light (towards windows, for example) the camera can struggle to meter and expose the scene accurately while in Auto mode. But switching to spot mode for light metering can help to compensate for this when using Program mode. There are several white balance options to chose from, including the opportunity for a custom white balance, all of which work fairly well to keep colours accurate. Generally we found the automatic white balance function was more than capable at selecting the right balance for the situation. The custom white balance is a snip to use, accessed by a single menu click. When zooming in to 100% on high contrast edges, a small amount of chromatic aberration can be seen, but certainly nothing that would be visible at normal printing and web sizes, such as A4 (US letter size) and below. Since it’s part of the High Sensitivity system (HS) range from Canon, you’d expect the Canon IXUS 255 HS to produce good images even when shooting in low light, and it does. Sensitivity ranges from ISO 80 to ISO 6400, and retains a good amount of detail even when shooting at higher sensitivities, such as ISO 1600. The Auto sensitivity setting does a good job of selecting the appropriate sensitivity for the scene too, which some compact cameras can have trouble with. It does start to struggle with moving objects while shooting in low light, losing a little detail, but that’s to be expected. We didn’t have much need to use the flash on the Canon IXUS 255 HS because the low light performance was so impressive, but when we did it fired quickly, and the slow synchronisation option gives some nice results for portraits. Although the IXUS comes with Stitch Assist, enabling you to take panorama images, it’s worth noting that it doesn’t actually assemble these images in the camera into one shot, which was a little disappointing. You have to use editing software to achieve this effect, which, considering you can now take seamless panorama shots on several smartphones, seems a little outdated. The Sweep Panorama function on Sony Cyber-Shot cameras is vastly easier to use. The optical zoom performance is impressive, with image stabilisation helping to keep the view steady while you compose your shot at the far end of the telephoto optic. The resulting images remain as sharp and in focus as those taken at the wide end of the lens. Image quality starts to suffer once you’re in the realms of digital zoom, but this isn’t uncommon with compact cameras, and the 10x optical zoom is pretty much sufficient for most uses. We were a little underwhelmed by many of the filters available for use on the Canon IXUS 255 HS. We used the Toy Camera mode several times (which gives you the option of a cool, warm or standard filter) but Fish Eye, Soft Focus, Colour Accent and Colour Swap seemed more like gimmicky options than choices that could enhance your photos, and remained relatively unused. Of course filters and overlays do come down to personal preference, so it’s nice that they’re included if you’d like the option to play around with your photos a bit. We liked Super Vivid mode but noticed that (especially those with a blank background) the colours were a little blown out in some photos, making the image appear cartoonish. For the most part it worked well though, bumping up the contrast for a pleasing effect. Miniature Effect mode, which enables you to simulate the effect of a tilt-shift lens with the click of a button, also works well and is fun. With the macro mode enabled, the Canon IXUS 255 HS is able to capture a decent amount of fine detail without distortion, and was great at capturing close up shots. Video options on the Canon IXUS 255 HS are limited – you get three sizes to choose from and a wind filter. However, the HD video is superb, and you can shoot while the camera is in many of its scene modes, which enables you to have some control over the overall look of your video footage without having to do any post production off-camera. The Canon IXUS 255 HS adjusts well to changes in exposure and focus during shooting, which is something we’ve seen lacking in other compact cameras. The only disappointment is the Super Slow Motion Movie mode, which works well but shoots at a low resolution that you can’t alter. There’s no in-camera editing to really speak of, although you can rotate images via the menu structure. Overall, the Canon IXUS 255 HS is a solid, dependable, easy to use point and shoot camera. With its full price of £230/US$230/AU$280, it sits comfortably in its price bracket, shared by rival cameras such as the rugged Fuji XP200, stylish Nikon Coolpix S9500 and ultra wide-angled Panasonic SZ9. You can power on and take a shot within a matter of seconds, making it almost as quick to use as your always-to-hand smartphone, but with a resulting image quality that far outstrips its mobile competitors. It also offers an array of useful functions without cramming too much in for gimmick value, making it simple and easy to handle. The Canon IXUS 255 HS is capable of producing some excellent images, with plenty of detail and vibrant colours. Pleasingly, we also found the HD video shooting to be good, making it useful for those who want to shoot the occasional home movie too. Yet compared to the Panasonic SZ9, for example, the IXUS appears to offer a little less for your money, with only 12.1MP to the SZ9’s 16.1MP, and without the ability to take photos remotely via Wi-Fi that the SZ9 enjoys. The overall performance of the Canon IXUS 255 HS is hard to beat, offering the ability to capture sharp photos, rich colours and high quality HD video. But the camera’s Wi-Fi options could be stronger – we’d like to see the ability to use your smartphone as a remote trigger for it to be a really worthwhile feature. 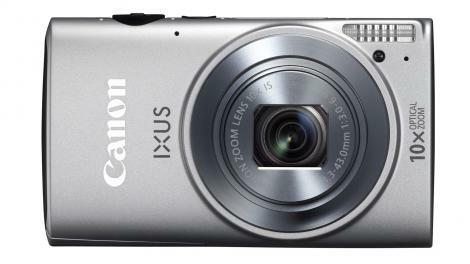 If you’re looking for a good all rounder then the Canon IXUS 255 HS is a great little camera that won’t break the bank. The latest addition has earned its spot in the well known, trustworthy Canon IXUS lineup. The optical zoom performance on the Canon IXUS 255 HS is impressive. For those who want to work on images in post production, there is some scope for adjustment to get the look you want. This shot has had the colours and contrast boosted. Here is the original shot straight from the camera. We were impressed with the macro function on the Canon IXUS 255 HS. Super Vivid mode produces bright, vibrant colours. Miniature Effect produces a pleasing tilt-shift effect. The majority of the time the Canon IXUS 255 HS takes well balanced and exposed images. Another example of the superb optical zoom performance. The Canon IXUS 255 HS is able to produce sharp detail, even while dealing with bright sunlight. Exposure is generally good on the Canon IXUS 255 HS, although occasionally it can lean towards over exposing – an example seen here in the sky.